Kane Lamberson received his first of many blood transfusions as a newborn. We first introduced Circulator readers to Kane Lamberson in our Summer 2011 issue (click HERE for that story). At that time, Kane had not yet received a diagnosis. The family moved out of state for a while, but returned to Springfield and got in touch with us. Let’s catch up with Kane now. An exchange transfusion — which removes some of the patient’s blood and replaces it with fresh donor blood — was performed to replace one-quarter of the baby’s blood volume, but the procedure didn’t achieve the results physicians wanted. The next step was another exchange transfusion, this time pumping out all of the baby’s blood and replacing it with donor blood. Due to the blood in Kane’s body not being his own, doctors weren’t aware of his underlying problem — congenital dyserythropoietic anemia (CDA) type 1 — and he didn’t receive a diagnosis until he was 18 months old. While Kane has undergone countless blood and platelet transfusions, there have been a few periods of time when he hasn’t needed transfusions. Currently, he has been transfusion-free since March 30, 2016. He goes to the St. Jude Affiliate Clinic at Mercy Children’s Hospital in Springfield, Missouri, for lab work at regular intervals. The results of that lab work indicate whether another transfusion, which typically takes about six hours, will be needed. 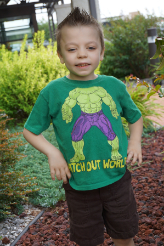 The rare CDA type 1 and a hip disease have resulted in Kane having a small stature for his age and delayed motor skills, but he is a happy, intelligent seven-year-old who plays Minecraft, loves the minions from “Despicable Me,” and wants to be a construction worker when he grows up. Blood transfusions will always be part of Kane’s life. “He’ll have to be very in tune with his body to know how he’s feeling and get labs,” Liz said. If she could meet the many donors whose blood was given to her son, Liz says she would probably cry and express her gratitude. “Without blood donors, he wouldn’t have lived,” she said. Congenital dyserythropoietic anemia (CDA) type 1 is an inherited blood disorder characterized by moderate to severe anemia. It is usually diagnosed in childhood or adolescence. Many affected individuals have yellowing of the skin and eyes (jaundice) and an enlarged liver and spleen (hepatosplenomegaly). This condition also causes the body to absorb too much iron, which builds up and can damage tissues and organs. Iron overload can lead to an abnormal heart rhythm (arrhythmia), congestive heart failure, diabetes, and chronic liver disease (cirrhosis). Rarely, people with CDA type I are born with skeletal abnormalities.